This article is about Westinghouse Electric Corporation which was founded in 1886, and changed its name to CBS Corporation in 1997. For the former commercial nuclear businesses of Westinghouse, see Westinghouse Electric Company. For the brand White-Westinghouse that is used on major appliances by Electrolux Home Products, under license from Westinghouse Electric Corporation, see White-Westinghouse. For other uses of "Westinghouse", see Westinghouse (disambiguation). The Westinghouse Electric Corporation was an American manufacturing company. It was founded on January 8, 1886, as Westinghouse Electric Company and later renamed Westinghouse Electric Corporation by its founder George Westinghouse (1846–1914). 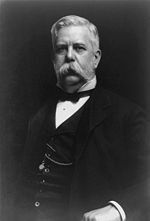 George Westinghouse had previously founded the Westinghouse Air Brake Company. The corporation purchased the CBS broadcasting company in 1995 and became the original CBS Corporation in 1997. 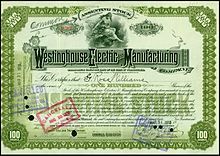 January 8, 1886 (1886-01-08) in Pittsburgh, Pennsylvania, U.S.
Westinghouse Electric was founded by George Westinghouse in Pittsburgh, Pennsylvania in 1886. The firm became active in developing electric infrastructure throughout the United States. The company's largest factories were located in East Pittsburgh Pennsylvania, and Lester, Pennsylvania and in Hamilton, Ontario, where they made turbines, generators, motors, and switch gear for generation, transmission, and use of electricity. In addition to George Westinghouse, early engineers working for the company included Frank Conrad, Benjamin Garver Lamme, Oliver B. Shallenberger, William Stanley, Nikola Tesla, Stephen Timoshenko and Vladimir Zworykin. Early on, Westinghouse was a rival to Thomas Edison's electric company. In 1892, Edison was merged with Westinghouse's chief AC rival, the Thomson-Houston Electric Company, making an even bigger competitor, General Electric. Westinghouse Electric & Manufacturing Company changed its name to Westinghouse Electric Corporation in 1945. Westinghouse purchased CBS Inc. in 1995. Westinghouse Electric Corporation changed its name to and became CBS Corporation in 1997. In 1998, the Power Generation Business Unit, headquartered in Orlando, Florida, was sold to Siemens AG, of Germany. A year later, CBS sold all of its commercial nuclear power businesses to British Nuclear Fuels Limited (BNFL). In connection with that sale, certain rights to use the Westinghouse trademarks were granted to the newly formed BNFL subsidiary, Westinghouse Electric Company. That company was sold to Toshiba in 2006. In 1990, Westinghouse experienced a financial catastrophe when the Corporation lost over one billion dollars due to bad high-risk, high-fee, high-interest loans made by its Westinghouse Credit Corporation lending arm. In an attempt to revitalize the corporation, the Board of Directors appointed outside management in the form of CEO Michael Jordan, who brought in numerous consultants to help re-engineer the company in order to realize the potential that they saw in the broadcasting industry. Westinghouse reduced the work force in many of its traditional industrial operations and made further acquisitions in broadcasting to add to its already substantial Group W network, purchasing CBS in 1995. Shortly after, Westinghouse purchased Infinity Broadcasting, TNN, CMT, American Radio Systems, and rights to NFL broadcasting. These investments cost the company over fifteen billion dollars. To recoup its costs, Westinghouse sold many other operations. Siemens purchased non-nuclear power generation, while other firms bought the defense electronics, office furniture company Knoll, Thermo King, and residential security. With little remaining of the company aside from its broadcasting, Westinghouse renamed itself CBS Corporation in 1997. During the 20th century, Westinghouse engineers and scientists were granted more than 28,000 US government patents, the third most of any company. The first commercial Westinghouse steam turbine driven generator, a 1,500 kW unit, began operation at Hartford Electric Light Co. in 1901. The machine, nicknamed Mary-Ann, was the first steam turbine generator to be installed by an electric utility to generate electricity in the US. George Westinghouse had based his original steam turbine design on designs licensed from the English inventor Charles Parsons. Today a large proportion of steam turbine generators operating around the world, ranging to units as large as 1,500 MW (or 1,000 times the original 1901 unit) were supplied by Westinghouse from its factories in Lester, Pennsylvania; Charlotte, North Carolina; or Hamilton, Ont. or were built overseas under Westinghouse license. Major Westinghouse licensees or joint venture partners included Mitsubishi Heavy Industries of Japan and Harbin Turbine Co. and Shanghai Electric Co. of China. Westinghouse boasted 50,000 employees by 1900, and established a formal research and development department in 1906. While the company was expanding, it would experience internal financial difficulties. During the Panic of 1907, the Board of Directors forced George Westinghouse to take a six-month leave of absence. Westinghouse officially retired in 1909 and died several years later in 1914. Under new leadership, Westinghouse Electric diversified its business activities in electrical technology. It acquired the Copeman Electric Stove Company in 1914 and Pittsburgh High Voltage Insulator Company in 1921. Westinghouse also moved into radio broadcasting by establishing Pittsburgh's KDKA, the first commercial radio station, and WBZ in Springfield, Massachusetts in 1921. Westinghouse expanded into the elevator business, establishing the Westinghouse Elevator Company in 1928. Throughout the decade, diversification engendered considerable growth; sales went from $43 million in 1914 to $216 million in 1929. Westinghouse produced the first operational American turbojet for the US Navy program in 1943. After many successes, the ill-fated J40 project, started soon after WWII, was abandoned in 1955 and led to Westinghouse exiting the aircraft engine business with closure of the Westinghouse Aviation Gas Turbine Division (Kansas City) in 1960. During the late 1940s Westinghouse applied its aviation gas turbine technology and experience to develop its first industrial gas turbine. A 2,000–horsepower model W21 was installed in 1948 at the Mississippi River Fuel Corp gas compression station in Wilmar, Arkansas. This was the beginning of a 50-year history of Westinghouse industrial and utility gas turbine development, prior to the sale by Westinghouse of the power generation business to Siemens, AG in 1998. Evolving from the Small Steam and Gas Turbine Division formed in the early 1950s, the Westinghouse Combustion Turbine Systems Division was located in Concordville, Pennsylvania, near Philadelphia and the old Lester, Pennsylvania plant, until it was relocated to Power Generation headquarters in Orlando, Florida in 1987. As a result of its participation in the US government's military program for nuclear energy applications (e.g. The Nuclear Navy) Westinghouse was instrumental in the development and commercialization of nuclear energy systems for electric power generation. This business currently operates as the Westinghouse Electric Company, and is owned by Toshiba of Japan. Electricite de France (EDF) a major global player in the nuclear power business, was a long-time licensee of the Westinghouse nuclear technology. Additional major industrial products in the widespread Westinghouse portfolio included electric motors of all sizes, elevators and escalators, controls and lighting. The Large Motor Division, once headquartered in Buffalo, NY, entered a joint venture with Taiwan Electric Co. (TECO) in the 1970s and today operates as TECO-Westinghouse. Much of Westinghouse's higher voltage power equipment was sold to ABB in 1989 and renamed the ABB Power T&D Company. The Westinghouse Transportation Division (est. 1894) supplied equipment and controls for many North American interurban and streetcar lines, the San Francisco Bay Area Rapid Transit (BART), Washington DC METRO (WMATA), New York City Subway (NYCT) equipment from the 1890s elevated era to the R68A in 1988, among many other heavy rail and rail transit systems and built locomotives, often in partnership with Baldwin, Lima-Hamilton as well as supplying electrical and traction equipment for Fairbanks-Morse diesel locomotives. The division designed and built Automated People Movers (APMs) at several major U.S. airports, including Tampa, Dallas-Ft. Worth and Orlando. The Transportation Division was sold to AEG of Germany (1988), which merged into a joint venture of ABB and Daimler Benz named AdTranz in 1996. Ultimately, the unit was acquired by Bombardier of Canada in 2001 and is still headquartered in Pittsburgh, PA.
Westinghouse was also a leader in the design and manufacturing of household electrical products including radios, televisions, and other audio/video equipment, and both small and large electric appliances of all kinds, from hair dryers and electric irons to clothes washers and dryers, refrigerators and air conditioning units. For many years Westinghouse was a familiar household name and favored brand. After more than 50 years, and after playing a strong No. 2 to rival General Electric for most of that time, Westinghouse decided to exit the appliance business in the mid- 1970s. White-Westinghouse was formed when White Consolidated acquired the Westinghouse appliance unit in 1975. The company is also known for its time capsule contributions during the 1939 New York World's Fair and 1964 New York World's Fair. They also participated in the St. Louis World's Fair in 1904. They sponsored the Westinghouse Auditorium at the fair, where they showed films documenting Westinghouse products and company plants. Westinghouse was one of the original corporate sponsors and exhibitors at Walt Disney World's EPCOT attraction in Orlando, FL. There has been a number of Westinghouse-related environmental incidents in the US. Below is a short list of these. All of these are chemical pollution incidents; none of them involve nuclear reactors or nuclear pollution. Sharon Plant: The Westinghouse Sharon Plant was a 58-acre Westinghouse transformer production facility in Mercer County, Pennsylvania. The EPA's Recent Second 5-Year Overview (2013) of this toxic Superfund site determined that the Shenango River has been polluted due to Westinghouse operations in this area. The report notes that "the PCB concentrations in the fish tissue results for the channel catfish and smallmouth bass samples, an unacceptable risk is present even for [...] consumption rates of one meal per month"[verification needed]. This plant was no longer operational after 1984. Westinghouse submitted their final cleanup plan in 1998, and further action beyond their dissolution has been liable to CBS. The transformer business unit was sold to ABB in 1989. This site now houses a product design company. Adams County Plant: Westinghouse was fined $5.5 million in 1996 for polluting groundwater in over 100 wells, as well as other water sources, while operating its Westinghouse Elevator Company plant in Adams County, Pennsylvania. Degreasers and other toxic chemicals were released over a 5-year period in the 1980s. [verification needed] This business unit was sold to Schindler in 1988. Future liability for cleanup has been directed to CBS following the dissolution of Westinghouse Electric Corporation in 1999. Horseheads Site: Westinghouse operates a cathode-ray tube plant in Horseheads, New York. They were deemed responsible for pollution at the Kentucky Avenue Wellfield Superfund site in Horseheads, New York. Westinghouse polluted nearby soil, affecting the safety of a nearby aquifer and wells used by residents. One phase of the cleanup effort describes Westinghouse Electric Corporation's facility, designated "Disposal Area F" and the "Former Runoff Basin Area," which are contaminated with volatile organic compounds (VOCs), polycyclic aromatic hydrocarbons (PAHs) and arsenic, will be cleaned up using a combination of soil excavation and soil vapor extraction. At Disposal Area F, the area of contamination is about 0.3 acres. At the Former Runoff Basin Area, the contaminated soils cover approximately 0.7 acres. Disposal of the excavated soils occurred at appropriate off-site facilities. The removal of the PAHs and arsenic contamination will protect site workers and employees at the Westinghouse facility and the cleanup of the VOCs will help restore the quality of the Newtown Creek Aquifer. [verification needed] In 1986, Westinghouse entered a joint venture at this plant with Toshiba to produce CRTs. In 1989, Toshiba become some owner of this plant and the Westinghouse CRT business unit. Future liability has been shifted to CBS. Sunnyvale Plant: Westinghouse operated a plant which manufactured electronics for military systems in Sunnyvale, CA. Groundwater and soil near this plant are contaminated with PCBs, fuels, and volatile organic compounds (VOCs). Potential health threats to area residents include accidentally ingesting or coming into direct contact with site contaminants in soil or groundwater. There are municipal drinking water wells within 1/4 mile from this site, and 300,000 people get their drinking water from within three miles of the site. [verification needed] This business unit was sold to Northrop Grumman in 1996. Future liability for this action has been passed on to CBS. 1888 – licensing of Nikola Tesla's AC and Induction motor patents (Tesla hired as a consultant for one year but quits after a few months). 1893 – Hired Bertha Lamme Feicht, the company's first female engineer. 1914 – George Westinghouse dies, with a legacy including 361 patents and the founding of 60 companies. 1915 – New England Westinghouse Company opens for business. First product is Mosin–Nagant rifles for the Russian Czar's army. Within two years, the Bolsheviks overthrow the Russian Provisional Government and cancel a previous order of over 1 million rifles. Facing bankruptcy, Westinghouse is rescued by the American Government when it purchases the rifles for use by the military. 1919 – 8XE Pittsburgh experimental station goes on the air. 1919 – Creates RCA with GE, AT&T and United Fruit, buys the American division of Marconi. 1926 – In partnership with GE and RCA founds NBC Broadcasting. 1941 – after years of resistance to the unionization efforts of its employees and to the National Labor Relations Act, signs a national labor agreement with the United Electrical, Radio and Machine Workers of America after a United States Supreme Court decision that upheld the Act. 1945 – renames itself the Westinghouse Electric Corporation, and makes first automatic elevator. 1951 – conducts first live network TV in U.S.
1952 – opens Cathode Ray Tube facility in Horseheads, NY; facility housed three divisions: Cathode Ray Tube, Electronic Tube, and Industrial and Government Tube. 1955 – buys KDKA-TV (then WDTV) and KYW (originally, and currently WTAM) radio Cleveland. 1955 – Westinghouse J40 engine failure causes all F3H fighters using the engine to be grounded, and all other jets using it to switch to other engines. Westinghouse forced out of aircraft engine business. 1981 – acquires both cable television operator TelePrompter (sold 1985), Muzak (sold September 1986) and 50% of Showtime for $576 million. 1984 – buys Unimation robotics for $105 million. 1986 – buys Los Angeles TV station. 1987 – buys radio stations in Sacramento and Chicago. 1987 – buys electrical equipment, engineering and waste disposal divisions. 1988 – sells elevator/escalator division to Schindler Group, now known as Schindler Elevator Corporation. 1988 – spins Industrial and Government Tube Division off as Imaging and Sensing Technologies Corporation. 1988 – closes the East Pittsburgh generator and Lester, PA turbine plants, which had once been the primary Westinghouse manufacturing facilities. 1989 – buys Shaw-Walker Furniture and Reff Furniture. 1989 – buys Legacy Broadcasting. 1990 – buys Knoll International Furniture. 1994 – buys United Technologies' Norden electronic systems. 1996 – buys Infinity Broadcasting for $4.7 billion. 1997 – buys American Radio Systems for $2.6 billion, increasing station network to 175. 1998 – sells its non-nuclear power generation and energy units to Siemens AG, which operated under the name Siemens Westinghouse until 2003. 1999 – buys Outdoor Systems for $8.7 billion and King World Productions for $2.5 billion. 2006 – Viacom is split into two companies in January, with a new Viacom being spun off of the company, and the old Viacom being renamed CBS Corporation thus reviving Westinghouse's last name prior to sale and reversing the 1999 Viacom-CBS merger. 2010 – The Westinghouse Electric Company (Toshiba) opened new headquarters in Cranberry Township, Butler County, Pennsylvania where it preserves the industrial legacy of the original Westinghouse Electric Corporation. Westinghouse established subsidiary companies in several countries including British Westinghouse and Società Italiana Westinghouse in Vado Ligure, Italy. British Westinghouse became a subsidiary of Metropolitan-Vickers in 1919 and the Italian Westinghouse factory was taken over by Tecnomasio in 1921. Siemens Westinghouse, also known as Siemens Power Generation, Inc.
^ a b History of Tinicum Township (PA) 1643–1993 (PDF). Tinicum Township Historical Society. 1993. ^ a b "Steam Hammer, Westinghouse Works, 1904". World Digital Library. 1904. Retrieved April 8, 2018. ^ "TOSHIBA ACQUIRES WESTINGHOUSE FROM BNFL". ^ a b "Westinghouse Electric Corporation". Engineering and Technology History Wiki. ^ "Westinghouse Power Generation". RICHES of Central Florida. 1993. ^ "Westinghouse W21, Mississippi River Fuel Corp". RICHES of Central Florida. 1948. ^ Scalzo. A, et. al. (1994). "Evolution of Heavy Duty Industrial and Utility Combustion Turbines in the US" (PDF). ASME Gas Turbine Division. ^ "Bombardier, Pittsburgh Fact Sheet" (PDF). ^ "EPA Site Overview, Westinghouse Sharon Plant". EPA. ^ "Cleanup of Horseheads Superfund Site". EPA. ^ "Sunnyvale Superfund Site". EPA. ^ "William Stanley – Engineering Hall of Fame". Edison Tech Center. ^ John W. Klooster, Icons of Invention: The Makers of the Modern World from Gutenberg to Gates. ABC-CLIO. 30 July 2009. p. 305. Retrieved 10 September 2012. ^ a b "Bombardier Fact Sheet: Pittsburgh, Pennsylvania" (PDF). Bombardier Inc.
^ a b "WESTINGHOUSE ELECTRIC CORP. - The Encyclopedia of Cleveland History". Case Western Reserve University. ^ a b c d e f g h i j k l m n o p q r s "Westinghouse: Chronology". Ketupa.net. Archived from the original on 2013-04-03. Retrieved April 20, 2013. ^ "Westinghouse Company Enters Wireless Field", Electrical Review (1920-10-16) page 615. Retrieved on 2018-03-04. ^ "Westinghouse Electric Corporation". ExplorePaHistory.com. ^ Feurer R (2006). Radical Unionism in the Midwest, 1900–1950. University of Illinois Press. ^ "Heartland of UE Struggle". UE. September 2002. Retrieved 2008-04-20. ^ "You can be sure if it's Westinghouse". Time magazine. 1948. Retrieved 4 October 2018. ^ "Westinghouse Sign". Pittsburgh Press. 16 January 1968. p. 49. ^ Frank Hawkins (March 7, 1967). "PAT Rapid Transit System Years Away". Pittsburgh Post-Gazette. Retrieved 29 July 2015. ^ Ray Gustini (March 24, 2011). "Three Decades of Wall Street's Muzak Fixation". The Atlantic Wire. Retrieved April 20, 2013. ^ "Westinghouse Sells Muzak". Pittsburgh Post-Gazette. September 9, 1986. Retrieved 29 July 2015. ^ "Bombardier in the United States, page 3" (PDF). Bombardier Inc.
^ Massey, Steve (March 1, 1998). "Who Killed Westinghouse? - In the beginning". Pittsburgh Post-Gazette. Retrieved April 20, 2013. ^ "Edwin Herr Dies in East". The Milwaukee Journal. December 25, 1932. p. 4. ^ "Herr Quits as Westinghouse Head". The Pittsburgh Press. June 26, 1929. Retrieved 29 July 2015. ^ "New Westinghouse Head Is Optimistic". The Pittsburgh Press. February 25, 1938. Retrieved 29 July 2015. ^ "Gwilym Price, Retired Westinghouse Leader, Dies". The Pittsburgh Press. June 2, 1985. Retrieved 29 July 2015. ^ Gwilym A. Price, 89, a high school dropout who became.... Orlando Sentinel (1985-06-04). Retrieved on 2013-08-18. ^ Massey, Steve (March 1, 1998). "Who Killed Westinghouse? - Chapter 1: Doing Well by Doing Good". Pittsburgh Post-Gazette. Retrieved April 20, 2013. ^ Massey, Steve (March 3, 1998). "Who Killed Westinghouse? - Chapter 2: Sue Me, Sue You Blues". Pittsburgh Post-Gazette. Retrieved April 20, 2013. ^ Douglas Danforth: Executive Profile & Biography. BusinessWeek. Retrieved on 2013-11-02. ^ Massey, Steve (March 4, 1998). "Who Killed Westinghouse? - Chapter 3: Money, It's a Hit". Pittsburgh Post-Gazette. Retrieved April 20, 2013. ^ Massey, Steve (March 5, 1998). "Who Killed Westinghouse? - Chapter 4: Big Money and Bad Choices". Pittsburgh Post-Gazette. Retrieved April 20, 2013. ^ Massey, Steve (March 6, 1998). "Who Killed Westinghouse? - Chapter 5: Coming Apart at the Seams". Pittsburgh Post-Gazette. Retrieved April 20, 2013. ^ Massey, Steve (March 7, 1998). "Who Killed Westinghouse? - Chapter 6: Free at Last". Pittsburgh Post-Gazette. Retrieved April 20, 2013. Wikimedia Commons has media related to Westinghouse. "What Happened to Westinghouse?". Pittsburgh Technology Council. March 1999. Archived from the original on 2013-05-11. Retrieved 2012-10-03. "The Westinghouse Electric Company". Antique Light Sockets. Retrieved 2010-07-10.